Having a deep understanding of your software-as-a-service (SaaS) business’ traffic is a fundamental piece of the financial health puzzle. To gain that understanding, you have to dive deep into each channel, evaluating and optimizing each separately from one other. What most SaaS companies underestimate is just how much the expectations and needs of their audience can diverge between organic and paid traffic sources. Often, the traffic that comes through each channel arrives for different reasons, with completely different goals. To maximize your return through each channel and properly optimize your website, they must be separate. Lumping all of your channels together in a single metric model can provide misleading data that leads to missed opportunities and causes you to make poor decisions. This is true for all SaaS KPIs, but is especially true CAC Payback Period. Because the acquisition costs and sales cycles for organic and paid channels can differ so greatly, the two channels can produce wholly different results. In evaluating them individually, you have the opportunity to optimize each channel for conversions, while gaining a better understanding of your customers. In addition, the same rings true for sales cycles, which we touch on here. In our years of experience working with SaaS companies, we’ve seen a number of metrics rise to popularity and fade out again in short order. As companies scramble to look for a single metric that provides them with a reliable top-down view of their company, they quickly find that different metrics suit different companies and situations. In recent years, we’ve seen metrics like pipeline growth, SQL creation, LTV ratios, and a handful of other metrics used to provide this big-picture look at the health of their business rise to popularity. Let’s clear this up now — there will never be a “perfect” metric. No thriving SaaS company will be able to evaluate the health of their company on the back of a single KPI. There will always be a need to evaluate their situation from several angles. However, there is one metric that we believe does rise above the rest, particularly for smaller, bootstrapped SaaS companies — CAC Payback Period. CAC Payback Period is the time in which it takes a company to recoup the investment they made in acquiring a new customer. Once you break even on a customer, you’ve reached their CAC Payback number. So if it cost your company $25 to acquire the customer, how long before the company earns that money back? Most healthy SaaS companies enjoy gross margins that fall between 85-90 percent of their gross revenue. 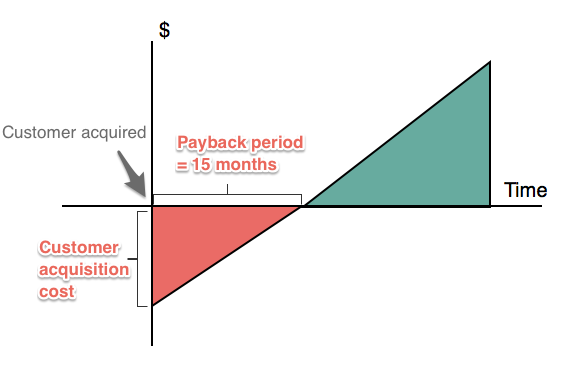 Because most SaaS companies acquire customers on a monthly or annual subscription plan, the CAC Payback Period is usually measured in a number of months it takes to reach the acquisition investment price. For example, at a $25 CAC and a $10 subscription plan with 85-90 percent gross margins, the CAC Payback Period would be in the neighborhood of 3 months. By driving down the acquisition price or increasing the monthly revenue from each customer, SaaS companies can reduce their CAC Payback, resulting in healthier cash flow. What Makes CAC Payback Period so Great? CAC Payback Period is our preferred metric at OpGen Media because it speaks to a wide range of important business information while focusing primarily on cash flow. CAC Payback Period also uses gross margins instead of topline revenue, which provides a more accurate depiction of your company’s financial health. Using CAC Payback often shows that your company values risk mitigation and cash flow, even if it means you’re capping your over overall return, which more often than not results in a healthier business, assuming you're bootstrapped or aiming for profitability versus top-line growth. We always recommend that our SaaS clients begin tracking and evaluating CAC Payback, even if they are having success with other metrics for these reasons. However, the metric isn’t perfect. If you don’t take acquisition channels into account and evaluate them on their own, CAC Payback can provide some misleading results that cause mistakes to be made and opportunities missed. It is critical that you separate major channels from each other when using CAC Payback. Even on the same platform, like Google or Facebook, using different models for paid and organic traffic evaluations is important for developing a full understanding of your traffic. You should never assume that organic and paid traffic will convert at the same rate or in the same period of time. Two different channels can produce very different results. Failing to evaluate organic and paid traffic separately can skew your results toward the channel that delivers the most customers. Organic and paid channels won’t convert at the same rate. It is entirely possible that one channel could convert at a very high rate while the other would provide comparatively disappointing results. In situations like this, it may be a good idea to dial back the budget on one channel and double-down on another. But without different Payback models, recognizing when you should do this can be difficult. Sales cycles will differ by channel. When you mix your channel evaluations together, things can get convoluted pretty quickly. The average sale cycles for organic and paid channels can look quite different. For instance, you may find that organic traffic tends to lean more toward customers who are in the “research” phase, resulting in them interacting with more content for longer periods of time before they become customers. Average monthly customer revenue may also differ. If your SaaS company offers multiple plans, you may find that customers through one channel choose higher-priced plans more often than the other. This can result in dramatically different CAC Payback Periods and seriously skew your results. Additionally, for the same reasons that you evaluate CAC Payback Period separately for each channel, you may want to consider doing the same for freemium vs. paid plans as well. In fact, the more segments that you can track CAC Payback Period for, the better. Tracking each channel separately can provide you insight into the effectiveness of those channels on a standalone basis. You can also segment and track CAC Payback Period for demographic segments, which could help you refine the type of customers that your SaaS company targets. All SaaS companies should be using advanced metrics and KPIs to monitor the health of their company. However, it’s important to make peace with the fact that you will never have an end-all-be-all metric that is easy to track that provides a complete picture of your business. In our experience, CAC Payback Period does fit this definition best. It focuses on the most important aspects of your business while providing a well-rounded view of your financial health. However, as good as the metric is, you still need to run different models for each traffic channel to avoid muddying the waters. Creating standalone models for organic and paid channels gives you a clearer picture of your customer acquisition strategies. The same concept can be applied to any traffic channel or customer demographic, allowing you to pinpoint where your best (and worst) customers are coming from, and adjust.